As Spring Showers are upon us - and I mean baby showers and bridal showers, this is an elegant yet easy appetizer to make! These are perfect little appetizers to serve at a spring shower or party! Super easy and quite delicious! Place fillo shells on top ungreased cookie sheet. Cut brie into small pieces and place inside of miniature fillo shells. 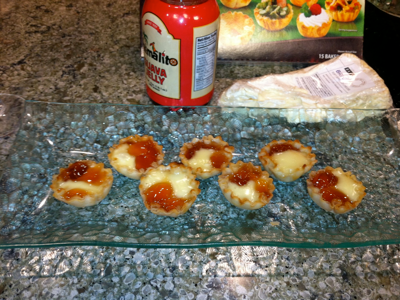 Place about 1/2 teaspoon guava jelly on top of brie. Bake at 325 for 5 to 10 minutes, or until the brie has melted.